This poster shows how 'KIng' was deliberately promoted as an exemplar of the advantages of the new widescreen format, designed to contrast with the small TV screen format. This poster also emphasises the new widescreen process, with its implicit contrast with small screen television, which in 1950s USA was usurping the popularity of movies there. THis poster emphasises the movie's star, Tyrone Power, and downplays its widescreeen process. 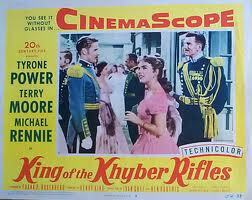 The Kyhber Rifles are not a scriptwriter's fiction. They were formed in the early 1880s as auxillary troops for the British Army in North-West India.They still exist today as part of the Pakistani army's Frontier Corps. Guy Rolfe,left, as King's Indian foster brother. One of the more interesting aspects of King of the Khyber Rifles is its focus on race relations, and its interest in the relationship between colonisers and the colonised. The hero, King,played by Tyrone Power, is a half-caste, and his foster brother, Kharam Khan, enemy of British rule, is a tribesman. 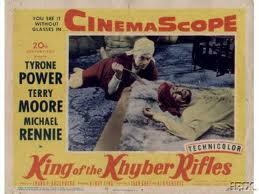 King of the Khyber Rifles is one of the few movies to be based on the Indian Mutiny of 1857. In this still the hero, played by Tyrone Power, confronts the rising anti-British feeling in an Indian marketplace. Leon Shamroy, centre, examining an early cinemascope lens. 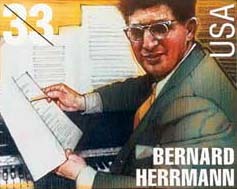 The movie's music was the work of the brilliant composer Bernard Herrmann (Psycho, Taxi Driver, Citizen Kane). His score uses Indian influences, pounding percussion and his own variant on a waltz. Listen to his Prelude for the movie's soundtrack below. Henry King was one of Hollywood's most underrated directors. 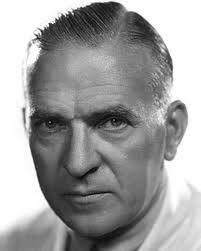 He had a long life (born 1886,died 1982) and a long Hollywood career. KIng directed the first of his more than 100 films in 1915.He was twice nominated for the Best Director Oscar. His films show a wide range range of subject and style. 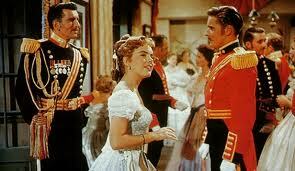 They include action movies like King of the Khyber Rifles, as well as literary adaptations (The Sun Also Rises), westerns (The Gunfighter) and musicals (Carousel). 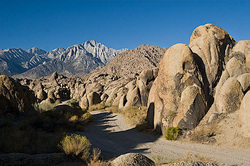 This Alabama Hills, Lone Pine setting, used for several scenes in the movie, was also the location for many westerns. 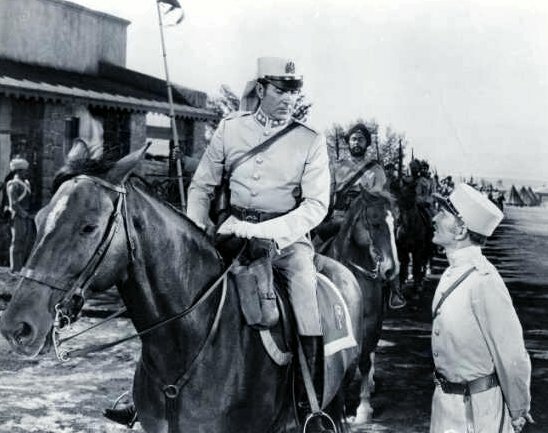 'King' shared many characteristics of the western genre known as 'cavalry westerns': a mounted cavalry unit, surrounded by native enemies, divisions within the unit, the role of officers under pressure, romantic and otherwise, and increasingly in the 1950s, issues of race. 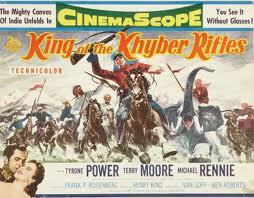 It took more than two decades for the film script for King of the Khyber Rifles to progress from film script to film. During this time 20th Century Fox and the U.K. government's India Office argued over the proposed movie. An India Office memo of 1936 stated "We would much prefer that this film should not be produced if it is possible to stop it." John Ford's 1930s' epic The Drum had angered nationalist opinion in India during that decade, causing riots in Madras and Bombay. Indian Office officials wanted to avoid any source of Anglo-Indian friction during the tense decades of Gandhi's movement for Indian independence and during World War 2, when some nationalist groups objected to Indians fighting in the war alongside the British. 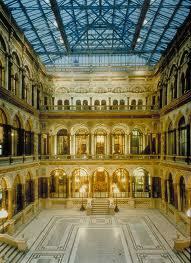 Lavish interior of what was the India Office, the centre of London's control of British India for almost a century. The plot concerns the efforts of Captain Alan King to subdue insurgent native elements in the Khyber area who are attempting to overthrow British rule in the form of the Peshawar garrison.. The rebels are led by Kerram Khan, an old boyfriend of King, who is of mixed Anglo-Indian parentage.Not only does King have to deal with overcoming his former companion. 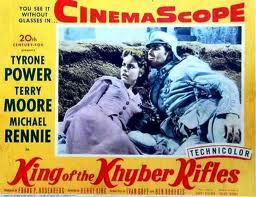 He also has to deal with racial prejudice, simmering tensions between colonisers and the colonised and the not unwelcome attentions of the Garrison's colonel's beautiful, impetuous and strong-willed daughter.For all the cliches of the plot, King of the Khyber Rifles is a neglected movie by a neglected director. It deserves greater recognition. King was the first of the movies shot in the Cinemascope widescreen process to make effective and intelligent use of its potentialities, unlike, for example, its contemporaries The Robe and Three Coins in the Fountain. The director Henry King, working with the great cinematographer Leon Shamroy, not only used Cinemascope to deploy large casts in sweeping, panoramic shots of pursuits, rugged terrain and battle. They also used to it enhance scenes in confined settings, such as the tents of the Indian tribesmen, and in suggesting emotional relationships.Look at the excerpt below to see how the larger screen space is used to illustrate the changing relationship between Tyronne Power and the impetuous Terry Moore in a way that anticipates Stanley Kubrick's famous chateau interior sequence where he uses spaces and movement to mirror the frustration of Dax and his conflict with his superior officer. The movie also deals with two issues not usually associated with action movies. Its plot focuses on a racial issue. The hero, King, is of mixed race - Anglo-Indian - and for this he is rejected by a fellow officer. His commanding officer is uneasy with this racist attitude, and the commander's daughter treats it with contempt. KIng himself is proud of his mixed race and makes no attempt to hide it. His foster brother is a tribesmen leading the anti-British forces in the region. 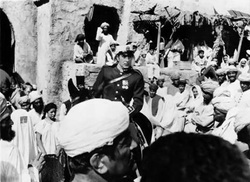 Several scenes in the movie depict patronising attitudes and actions by the British towards their colonial subjects - hardly a subject to be expected in a fifties Hollywood epic. King of the Khyber Rifles is also one of the few films set during the 1857 Indian Rebellion (as Indians call it), also known as the Indian Mutiny ( as the British prefer). One of the most interesting sequences shows the hero trying to convince sceptical Muslim troops that their new rifles' cartridges are not coated with pig grease. Such allegations were a major catalyst in igniting the revolt. The film contains a major historical inaccuracy. It shows the Khyber Rifles repelling rebels during the Indian Rebellion / Mutiny. 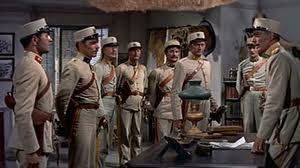 Impossible, because the Khyber Rifles unit was not formed until the 1880s! In 1897 Afridi tribes in the Kyber rose against the British, captured some forts and after a few months were put down with the help of the Rifles, whose troops were Afridi themselves. For suggested books and articles which provide further background and information on the historical events and the people associated with the movie, go to this Cliomuse page. 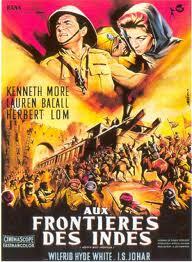 North West Frontier/ Flame Over India. Muslim-Hindu rivalry at the turn of the 20th Century. 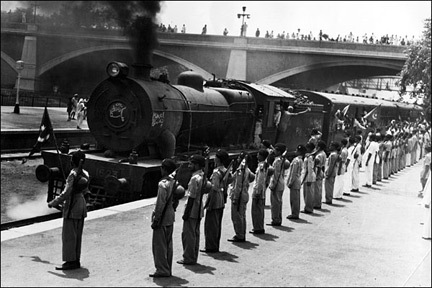 Scene from 'TRAIN TO PAKISTAN', a 1998 movie about the spread of communal violence to a small Punjabi town. 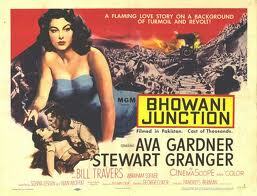 Inter-racial love and communal and political violence on the eve of Indian independence.